Clayton is a suburb in Melbourne, Victoria, Australia, 19 km south-east of Melbourne's central business district. 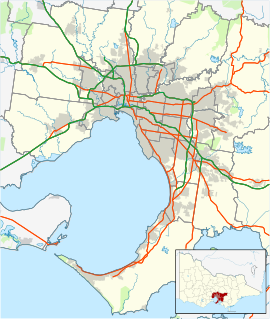 Its local government area is the City of Monash. At the 2016 Census, Clayton had a population of 19,358. The main focus for the suburb of Clayton is the shopping strip that runs along Clayton Road. The local railway station, situated at the northern end of the shopping strip bears the name Clayton railway station. In the 2016 Census, there were 19,358 people in Clayton. 24.7% of people were born in Australia and 25.7% of people were born in China. The next most common countries of birth were India 10.0%, Malaysia 3.9%, Indonesia 3.0% and Sri Lanka 2.7%. 25.2% of people spoke only English at home. Other languages spoken at home included Mandarin 26.9%, Greek 4.7%, Cantonese 4.2%, Indonesian 2.8% and Hindi 2.6%. The most common responses for religion in Clayton were No Religion 39.4% and Catholic 13.9%. The median age for Clayton was 25 which is 13 years younger the Australian average. Melbourne's second metropolitan university, Monash, was opened at Clayton in 1961. Monash is now Australia's largest university. Primary schools at Westall and Clayton West opened in 1961 and 1962, and high schools at Westall and Monash (Clayton North) in 1963 and 1965. In the early sixties Clayton Technical School was opened (Mr Warby inaugural Principal) at the northern end of Browns Rd Clayton, and had pupils attend from wide and far. It had a Science wing and Woodwork and Metalwork workshops, as well as providing studies of the main matric curriculum, however, it was only up to 5th form (year 11). To complete Matric students mainly transferred to the Oakleigh High School for the last year of studies. At its peak attendance would have been over 1000 male pupils. It was closed sometime in the 1980s. The only piece of land left from where the school once stood, is now titled Fregon reserve. In 1971 the Catholic bishops of Victoria and Tasmania purchased land adjacent to Monash University to house their seminary, Corpus Christi College. The seminary was moved to Carlton in 1999, and the site now serves as a conference centre. Numerous factories, including Volkswagen (later became the Datsun/Nissan plant), Wilke Printing, Robert Bosch GmbH and Repco were opened after the Second World War. Clayton South and Westall are closer to the sandbelt areas, with the Spring Valley Golf Club, The Grange Reserve and Heatherton Park. Sanitary landfill sites occupy former sand quarries. A large new building at the corner of Cooke Street and Centre Road was opened in April 2008. It houses the Clayton branch of the  Monash Public Library Service, a swimming pool, gym, counselling services, health and child care services, theatre and meeting rooms. The suburb is home to Clayton Football Club, currently competing in the Southern Football League and located at Meade Reserve, Haughton Rd, Clayton. The Club was formed in 1908 and after commencing at a ground on the cnr of Crawford Rd & Centre Rd, Clarinda, moved to its current ground in 1919. Clayton District Cricket Club also plays at Meade Reserve, Haughton Rd, Clayton. The Club was founded as 'Clayton Vale Cricket Club' in 1924 with its original ground in Wordsworth Ave, Westall. The Club moved to Namatjira Park, Springs Rd, Clayton South I n 1953 before settling at Meade Reserve in 1977. The suburb is home to Waverley Wanderers Soccer Club of Football Federation Victoria and also Waverley Oakleigh Panthers of Victoria Rugby League. The suburb is home to Clayton Bowls Club, located in Springs Rd, Clayton South. St Peter's Primary School, Mary St.
^ a b c Australian Bureau of Statistics (27 June 2017). "Clayton (State Suburb)". 2016 Census QuickStats. Retrieved 1 December 2017. ^ "Postcode for Clayton, Victoria (near Melbourne) - Postcodes Australia". www.postcodes-australia.com. ^ "St. Andrew's Presbyterian Church, Clayton". standrewsclayton.org.au. ^ "All Saints Clayton". All Saints Clayton. ^ "Clayton Parish Mass Times :: St Peter's , Mannix College - Catholic Archdiocese of Melbourne (Australia) - Infobyte Software Solutions". www.cam.org.au. ^ "Clayton Christadelphians". Clayton Christadelphians. ^ "Islamic Association of Monash Mosque Inc. - Home". www.monashmosque.org.au. This page was last edited on 13 April 2019, at 14:53 (UTC).